Photography covers a wide variety of subjects. Spend some time exploring different types while you are out there shooting rather than assuming that you already know what you would like to do. Portraiture may sound like exactly what you want to get into now, but you may find that you have more fun with event photography or landscape work. 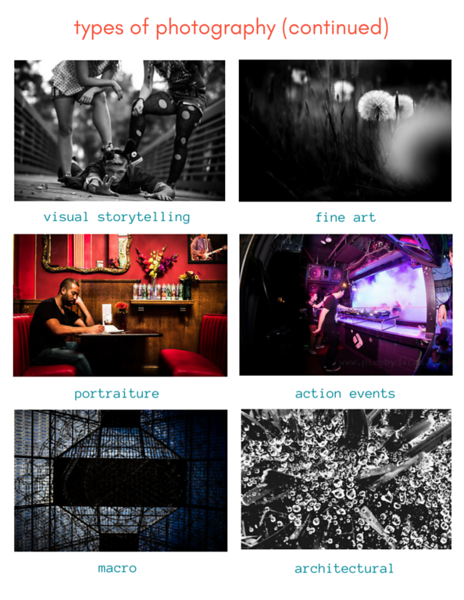 This overview only covers the more well-known types of photography that are out there and is not meant to say these are the only genres. The photos in the following examples are mostly of 3D photography. When switching from 2D to 3D photography, notice some differences. The biggest differences you will notice are that they have backgrounds, foregrounds, depth of field, shadows and/or reflections, depending on lighting and aperture. Your depth of field describes anything that is in focus in your images. For images with narrow apertures like landscapes your foreground can usually be understood by looking at size differences. Clearly the tree to the left isn’t bigger than a mountain range, so the human eye perceives that as an element of a 3D world. Shadows and reflections are found everywhere, and may be the most telling in distinguishing 3D from 2D photography. While you are looking at the images on the following pages, take a few steps back to elementary school, and determine what makes the images 3D: is it depth of field, foreground, background, shadows and/or reflections or a combination of these things? Usually has energetic crowds, and includes both candid and posed photography. Often provided at music and sporting events. Requires adaptability to fast paced changes in lighting, settings and human behaviors. Photographs of structures and buildings, including interiors and exteriors. May be used in real estate. Requires a deep understanding of how lines work and edge tension in photography. Sometimes uses aerial or other drone devices. May include any other genre of photography; e.g. portraiture, still, events or weddings. Requires a deep understanding of composition, lighting and attention to detail. Sub-genres typically include nature and astrophotography. Captures the personal lives of human subjects in their natural environment; e.g. home or work. Documentary style, sometimes used in photojournalism with heavy use of storytelling. More often than not utilizes wide angle lenses. Often used for small subjects like bugs and plants. Often utilizes abstraction with heavy focus on small and intricate details. Sees things that the human eye does not usually notice or cannot see. Covers current events, some of which may be controversial. Requires neutrality in major political, religious and social topics. Usually a series or set of photographs. May be dangerous and challenging. Photographs of live subjects. May be a group of subjects or a single subject. Sub-genres may include petography, boudoir, environmental portraiture, senior and business. Typically covers low-key events, meetings and conferences. Easy to manage lighting, and minimal creativity required. Sometimes covered by photojournalists. Requires professionalism. Photographs of inanimate objects like products and food. Taken in natural and controlled settings, commonly used in marketing & ads. 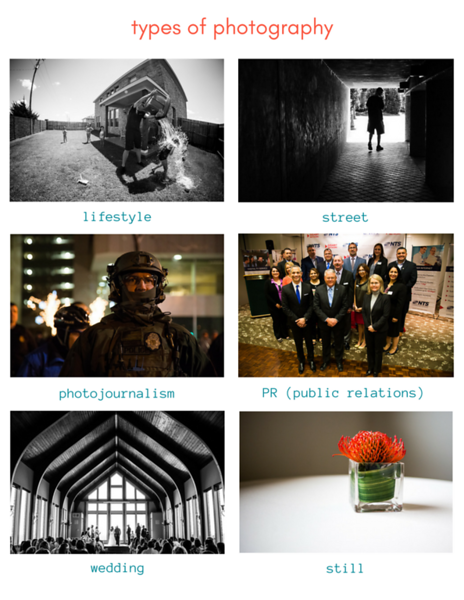 Use of images to tell a story, often used in photojournalism and lifestyle. May be planned sets or spontaneous and is part of a set of images. Captures city life and urban lifestyles and may include unfamiliar or unknown subjects. Frequent use of wide angle lenses andcaptures candid moments using artistic techniques. Uses elements from most other genres of photography including portraiture, still, action/event and storytelling. Requires the ability to collaborate with wedding designers/planners and client. PREVIOUS LESSON: LEARN TO EDIT WITH A HISTOGRAM IN BLACK AND WHITE! INTERESTED IN LEARNING MORE ABOUT PHOTOGRAPHY? MY EBOOK MAY BE JUST WHAT YOU NEED; COVERING TIPS, TRICKS & TECHNIQUES FOR BEGINNING PHOTOGRAPHERS TO TAKE THEIR WORK TO THE NEXT LEVEL!